With the launch of AustraliaPlus in China, the ABC has become the first mainstream western media organisation to launch a Chinese registered web portal. 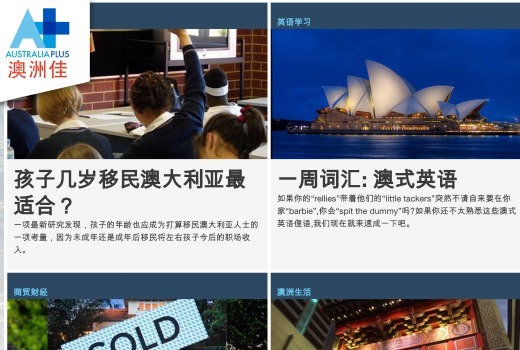 AustraliaPlus.cn has launched with a mix of Australian stories including business, education and travel aimed at a mainland Chinese audience as well as Chinese living in Australia. Multi-media content is produced in Chinese with some English language content aimed at Chinese wanting to work, study, do business or holiday in Australia. The portal also features English language programs such as documentary, drama and children’s programs. ABC International chief executive officer Lynley Marshall said “We have worked closely with our Chinese partners to reach this landmark day. AustraliaPlus.cn will offer stories covering Australian lifestyle, travel, studying and doing business in Australia, career opportunities, financial, business and sports news. It has a strong cultural presence with stories covering all the Australian arts including connections to ABC International’s partners such as the Melbourne Symphony Orchestra and the Queensland Ballet. The site also serves content from ABC’s world-leading Learn English programs as well as the world premiere of the Bobbie the Bear Live Action series – the lavender bear from Bridestowe Estate, Tasmania that has caused a sensation across China. ABC International signed an extended international media agreement with its main Chinese media partner, the Shanghai Media Group (SMG), in June last year and currently has 16 syndication and co-production partnerships with China’s leading television, radio and online organisations including CCTV, Beijing TV, China Daily Online, Tencent QQ, Sina and Youku. So the ABC cuts rural tv and radio services so it can spend money offering a service to China? Really, is that what we pay our taxes for? With every decision we see that MD Mark Scott is more about empire and influence building than serving the interests of tax payers. Whose ABC? Certainly not ours any more. You do realise, don’t you, that it is simply a local Chinese internet portal (one of many across Asia & India) of Australia Plus (which is the stub remaining of the Australia Network after the government required DFAT to pull both the original name & their funding for the TV service).